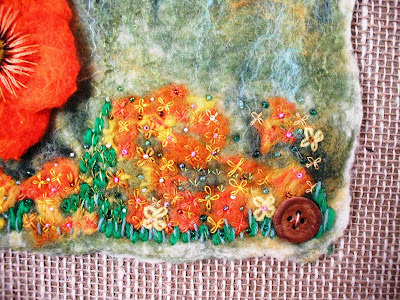 Realy lovely, " the red flowers in the evening" the flowers are telling something.. Thanks for your comment Jan. Anonymous comments are in danger of being zapped as spam. You got through this time. It's easy to put your name in the box. You should be pleased, it's lovely. Is it my imagination or is it 3D? 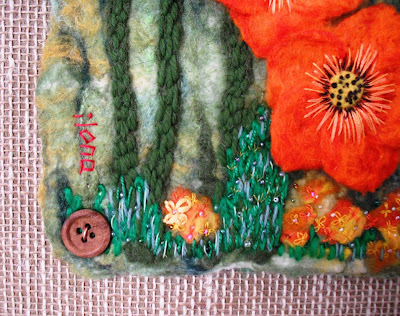 The hessian is perfect. Hi Cherie. I will be pricing up in the next couple of weeks in readiness for the exhibition. 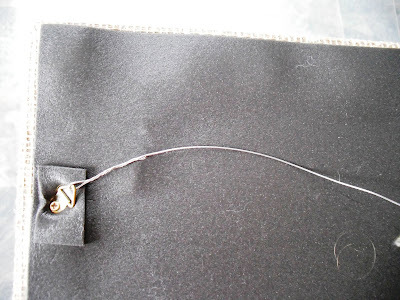 Sorry to say that I have no plans for selling through the blog or any other social media. The rules for distance selling can get complicated and I do not want to get involved with that. Face to face selling is best because that's how I would buy art myself. I want to see the real thing before I part with money. No point in putting prices on things here, because I wouldn't sell them, plus I want cash. That is absolutely beautiful . . . I love it! 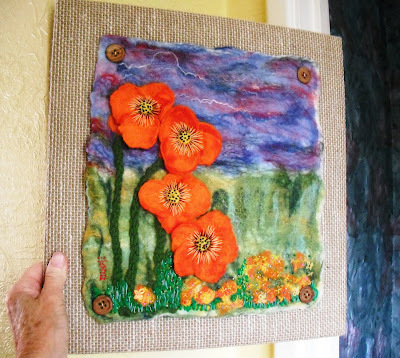 Your art is really beautiful .... very eye catching and reminds me of California poppies. I love orange! And so you should be pleased with your latest artwork. 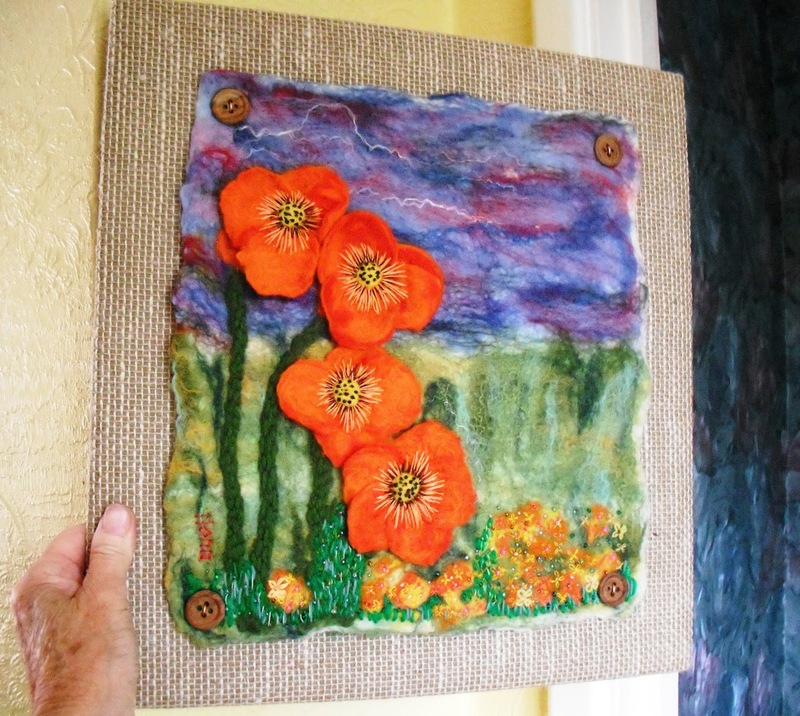 This kind of unframed textile art is just my cup of tea. I attended a workshop in May about needle felting and I enjoyed it but found it sore on my dicky shoulder with all the needling. You have inspired me to get the stuff out again and have another go. I love this artwork. Also the matting/sans frame. Thank you for sharing with us. You should be pleased with this piece of work. 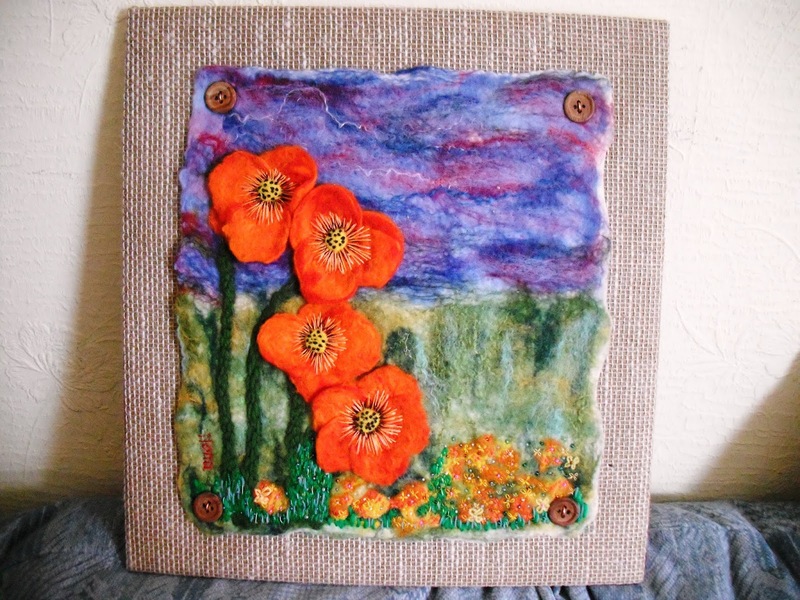 It's beautiful especially with the extra work you've done since felting it. I always look at felted and embroidered pictures with admiration but the results are never the same when I have a go. I'm not good at creating something out of a background suggestion. My O H is experimenting at the moment with dropping random ink blobs on to paper and creating pictures from the results. They are very clever and he is having great fun. 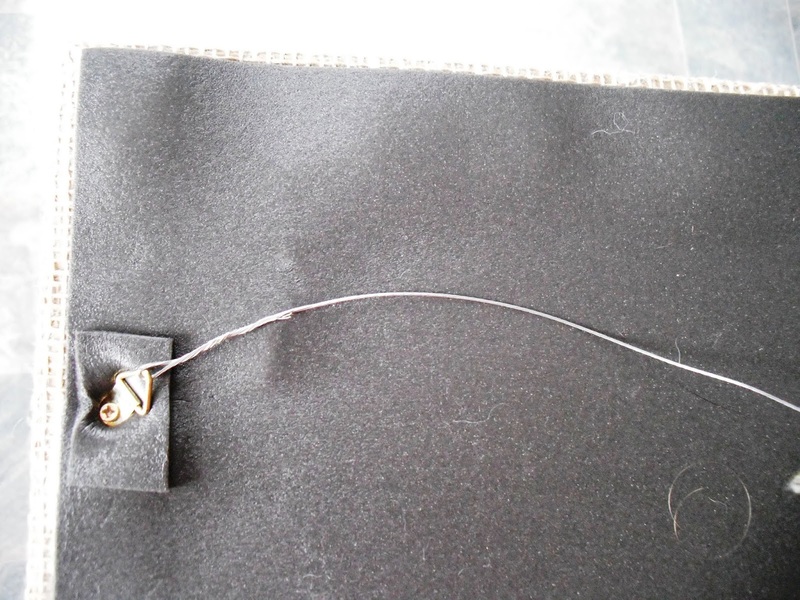 I love your clever fixing method and the backing sets it off beautifully reminding me of a cornfield. Hopefully you are finding your blog less stressful at the moment. I'm certainly glad you are continuing. Yes, feeling better about things now that I have given myself a good talking to. If I have nothing to say, I don't post. I write what is important to me, rather than what I think other people want to read. If I don't like the tone of a comment I delete it, there will be no explanation from me. I was trying to please everybody all of the time, not any more. Thanks for your comment, I'm glad you are still reading. I remember that hessian wallpaper, some of us would call it retro or vintage! Loving this artwork so colourful and I would happily hang it on my wall. This is absolutely gorgeous Ilona and one that I hope will be in your exhibition. 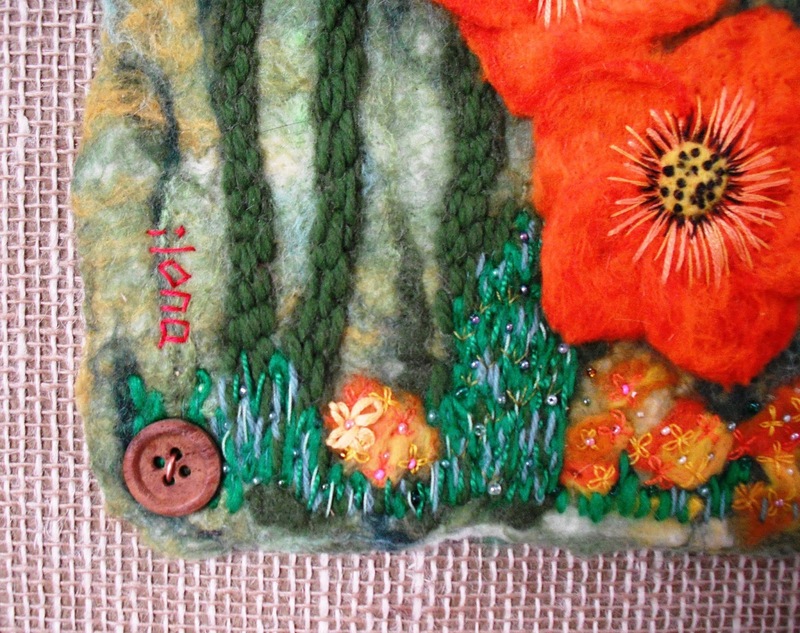 That is a lovely piece of felting, Ilona, and the hessian background sets it off beautifully! I don't think I've commented before, but i have to say this is, by far, my favourite item you have ever made. I really love it. Sometimes a bit of art work just resonates with you, you know? The flowers make me happy and the detail in the sky makes me think there is a storm with some lightening brewing or something! Kind of like some of the clamy summer storms we've had this year. 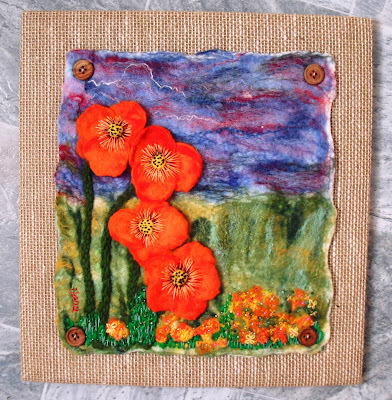 Will make a wonderful piece for your display!